Random thoughts as I comb through my photos for this pattern review. I suppose there is good cause for that as 2016 has been one of the two worst years of my life. I honestly can't wait for the ball to drop at midnight on December 31 because I do believe in the magic of a new year. 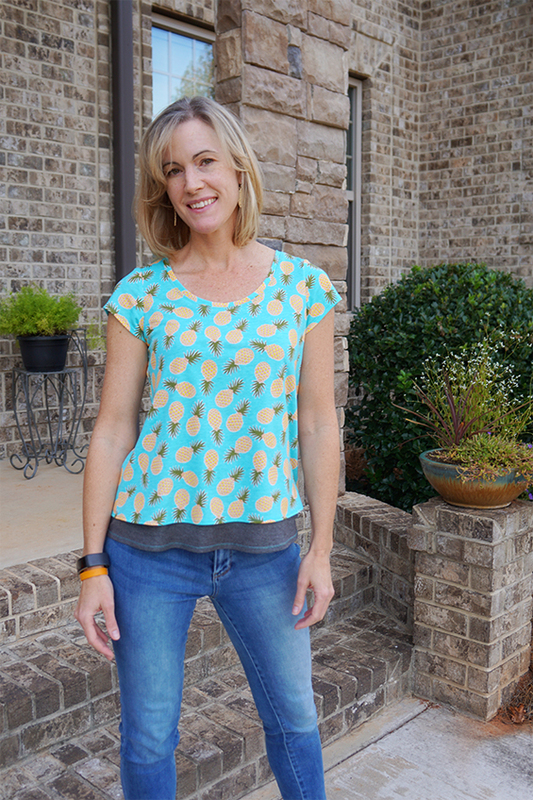 Old face or not, I am so excited to share this fun top with you! 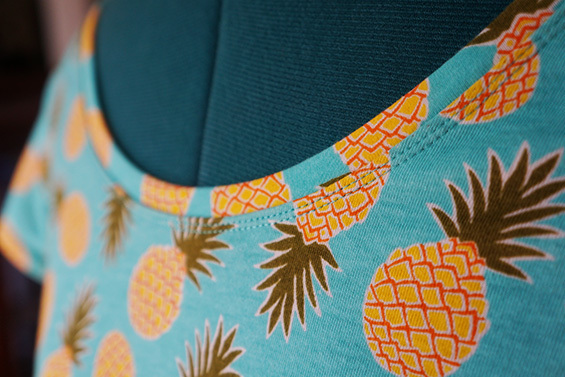 It was actually difficult to decide what to make with this amazing Girl Charlee pineapple knit, but I finally decided on Simplicity 1199 simply because it was already in my pattern stash. After pleading via the interwebs for someone to help me decide which solid knit to pair with the print, the majority decided on this dark gray. Perfect pick, my friends!! Perfect pick. I would rate this pattern as intermediate in difficulty. There are some tricky seams, such as easing of the sleeves at the shoulders, that might intimidate a beginner. But don't let that scare you! 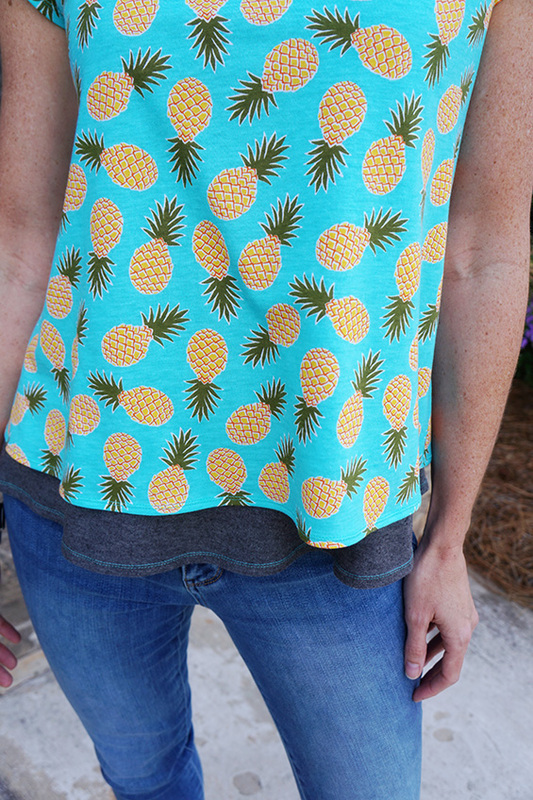 This is the perfect top to learn with. I don't usually get into the nitty-gritty of construction, but I did want to share a few changes that I made that I believe enhance the quality of the garment. I also RARELY show the inside of my garments because I'm lazy and my finishing efforts typically reflect that. 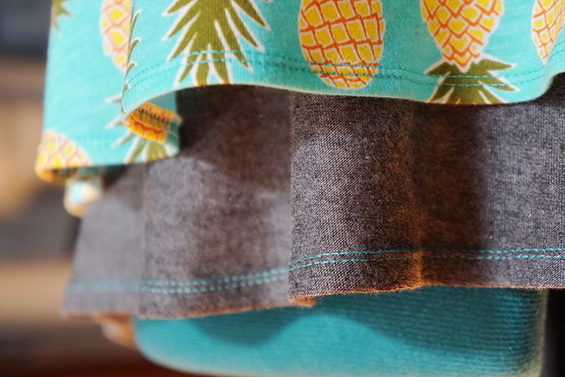 The pattern indicates that you should sew the right sides of the underlayer together to join. I did this for the sides, but then turned the garment right-side-out to sew the shoulder seams. That way, there is no exposed seam on the inside of the shoulders. 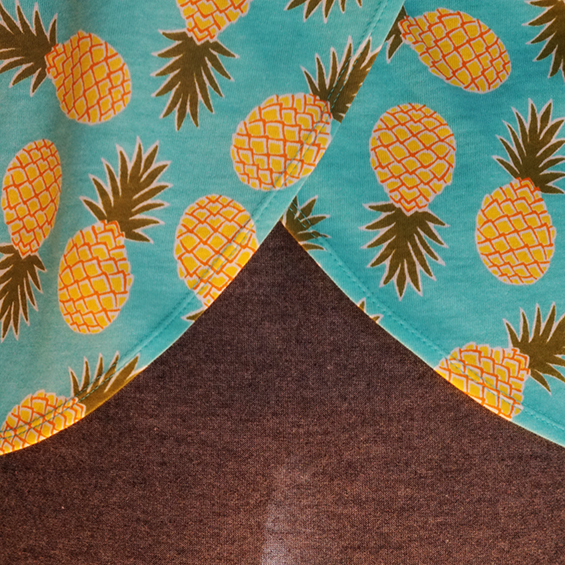 Here's a photo of the shirt turned inside out. It was a small change, but I'm pleased with the result. And while I have this garment turned inside out, take a look at the neckline. 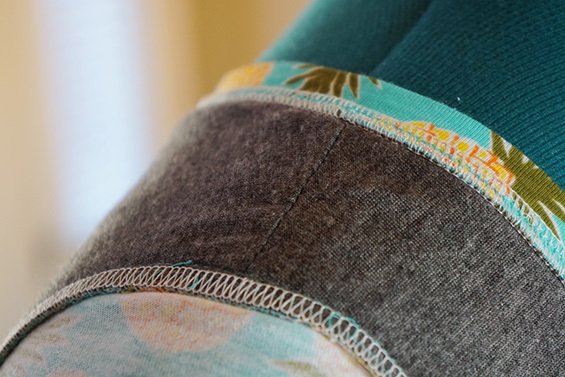 The instructions indicate that you should essentially make a double-folded bias tape to conceal the raw edge of the neckline. Instead, I folded the piece in half and sewed all of the raw edges together with my serger. 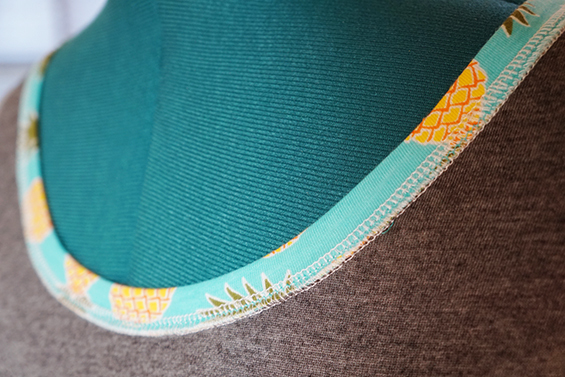 I then pressed the seam down and finished it off with an edge stitch. I'm lazy, remember? This change satisfied my lazy character and turned out a pretty fabulous finishing touch. One final point to share. I absolutely love sewing with double needles when working with knits. If you look at any RTW garment in your closet, you'll see the same hem detail. Just for fun, I used a coordinating turquoise thread to topstitch the gray. I adore this top. I do worry that the print is trending a bit young for me, but maybe I can get away with it? Meh... I've never really cared much about what others think of how I dress. Do you and rock it! I'm actually working on a few handmade Christmas gifts to share with you. It's been a LONG time since I've shared a craft. Life is just too dang busy.